Most of the time, I leave the office feeling great – I can usually look back at the day, be proud of everything I was able to accomplish and be excited for what is coming up next…unfortunately, not every day ends that way. Sometimes I walk out, eyes blurry and head spinning, wondering what I just did for the last 8 hours and why I don’t feel like anything was done! Everyone starts their day with the best of intentions, full of hope and ready to take on the world – so, what happens on the days we don’t? Where do we go wrong and what can we do to fix it? Studies have found that office workers get interrupted roughly every 3 minutes – and according to the University of California, it can take up to 23 minutes to return to your original task once you’ve been interrupted. Just a couple interruptions in a day and you’ve lost over an hour of time. What on the surface appears to be a harmless email or drop-in from a co-worker ends up being a productivity KILLER! In this case, knowing is half the battle – we know that distractions are inevitable, so what can we do to minimize them? Some top tips from productivity experts include limiting the checking of email to certain times of the day (or at the bare minimum, turning off any popups), working with headphones in (even if you’re not listening to music, people are more likely to give you your space), and putting your phone on Do Not Disturb (if it’s that important, they’ll leave you a voicemail). Starting your workday without at least some sort of organization is akin to a sports team showing up to a competition without any sort of strategy or game plan. Walking into the office without your own directive for the day leaves you at the mercy of and reactive to the needs/wants/asks of others…having a thought-out plan of attack allows you to take control of your day. Productivity experts push towards a sequential approach…don’t just create a “to-do” list, but rather a “to-do” map. Take the 2 most important, must-be-done, big-impact items on your list, and schedule blocks of time in which to address them (preferably in the morning) – treat these times as sacred and DO NOT allow yourself to push them, for anything or anyone. Group everything else into appropriate categories and build around your big-impact items – don’t forget that you’ll probably need to schedule blocks of time for the emergency stuff that comes up on a day-to-day basis. It doesn’t work…or at least not if you’re looking to produce good, quality work. Research shows that it’s not possible to effectively perform more than one job at a time (some recent studies estimate we lose 40% of our productivity by trying to multi-task). Focus on doing one thing at a time and doing it well. 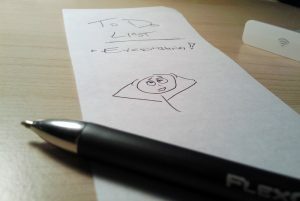 You’ll end up crossing more stuff off the list quicker than if you tried to do 2-3 things at the same time. One of the biggest hindrances in our quest to achieve more comes from the “little things” that pop up throughout the course of the day – sorting through and responding to the multitude of emails we receive, reviewing and filing paperwork, manually reconciling payments and receivables, etc…the list goes on and on. Luckily, it seems like every week there’s a hot new app or software program designed to help you automate some part of your day-to-day. What works best for you is going to take some trial and error, but one of my favorites is Evernote. The free version has a ton of great tools for automatically storing emails and web pages, saving travel plans, and collaborating with your colleagues on different projects. Lastly, and maybe most importantly, don’t forget to take a break! Researchers at the University of Illinois have found that taking mental breaks throughout the day can actually help to improve productivity. Over long periods of time, your brain stops registering the input from the task you’re attending, meaning you start to lose focus and begin to make mistakes. Take 10 to go for a walk, grab some coffee, or have a snack– as long as you’re getting up and getting away from your desk! It’ll take some time and a little work to find the right way to plan your day, but find the strategies that work for you and stick to them. It’s your day, and at the end of it, you need to zealously guard your time. For more tips on how to more easily manage your day, and your business subscribe to our blog. Mark is originally from Strawberry Point, IA, where he grew up in the shadow of the world’s largest strawberry and thus has developed an affinity for all strawberry flavored products (ice cream, soda, etc.). He graduated from the University of Iowa with degree in political science and journalism in 2008. After realizing he wasn’t suited for a profession in either field, he did the only logical thing he could think of and packed up to make the move to the mountains of Denver with neither job nor living accommodations. He eventually found his way to PaySimple a couple of months later. Mark’s been working on the sales team since July of 2008 – in his free time he tries to take in everything that Denver has to offer, from $4 baseball games to random “powder days” in the mountains to First Friday Art Walks through the different area museums.